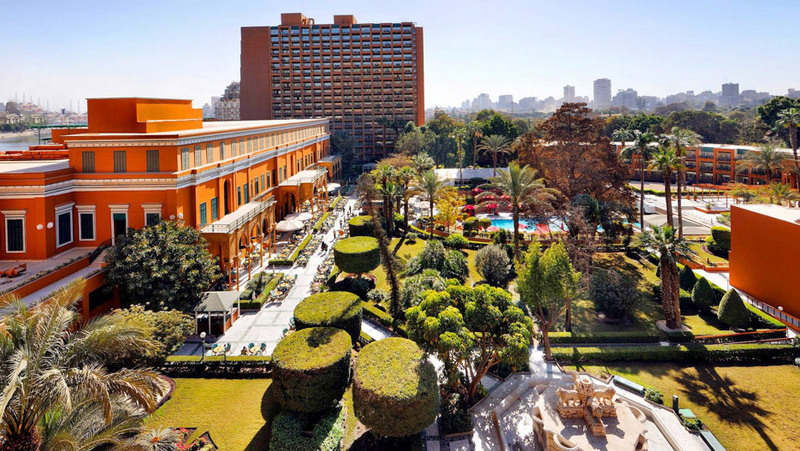 Set amongst 6 acres of beautifully lush gardens in a privileged location on an island on the River Nile, the Cairo Marriott Hotel and Omar Khayyam Casino truly boasts a unique, extraordinary setting. Comprised of two twin towers connected by a stunning garden promenade that flanks the historical Royal Palace Al Gezira, the hotel is a distinctive blend of tradition and elegance with contemporary facilities and amenities. 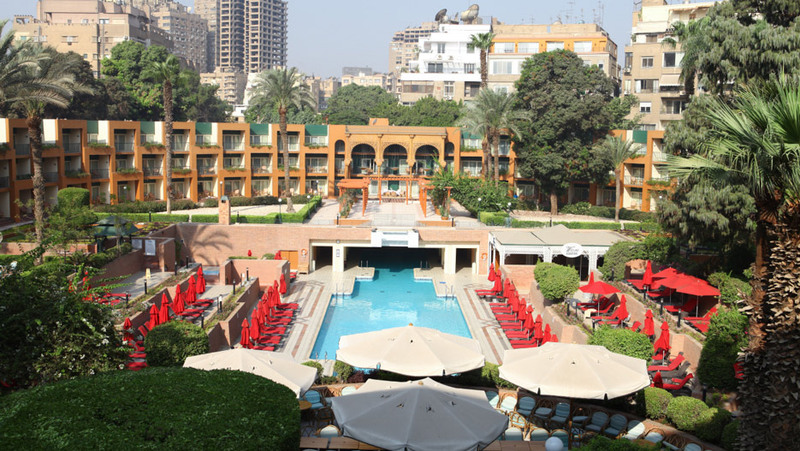 Located next to the exclusive residential area of Zamalek and adjoining the Gezira Sporting Club, the hotel offers stunning views over the emblematic River Nile. Visitors can arrive at the hotel from Cairo International Airport in just 30 minutes and find themselves in a fantastic location close to all of the main attractions such as the Pyramids, the Sphinx, Cairo Old Town, the citadel and the Khan El Khalili Bazaar. The Royal Palace Al Gezira was built in 1869 by Khedive Ismail, Ruler of Egypt, as a guest palace for the Suez Canal inauguration celebrations. It housed European monarchs including Empress Eugenie, wife of Napoleon IIII, who came to stay during these celebrations. To honour these visiting monarchs, the palace was built in a neoclassical style, popular in Europe at the time. The architect in charge was Austrian, Julius Franz and the chief interior designer was Carl Van Dietbitsch from Germany. 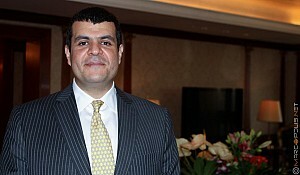 To this very day, every guest at the Cairo Marriott hotel is treated like royalty. In 1961, the palace was nationalised and became the Omar Khayyam Hotel. 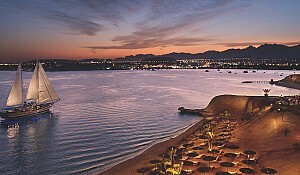 In the 1970s, the property was handed over to Marriott International for management. Marriott restored the original palace and equipped it will all of the amenities of a five star hotel and surrounded it by two modern towers that together house 1,087 rooms and various suites. Much of the original palatial furniture, highly prized antiques have been preserved and restored and many of the original rooms are now used as reception rooms and lounges. In fact the hotel has its own museum curator in charge of all of the historical artefacts on site. 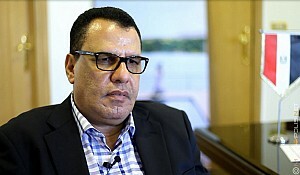 The Cairo Marriott Hotel was opened on October 1st, 1982 and since then has been a leader in luxury hospitality and business services in Cairo today. The hotel has more than one thousand beautifully appointed rooms, including 131 executive rooms, 71 Diplomatic Suites, 28 Executive Suites, 5 Presidential Suites, 3 Ambassador Suites and 2 Royal Suites. Each tower has 20 floors and there is a Garden Court wing that occupies 3 floors. The Executive services are spread over 8 floors and are exclusive to the executive level guests. There is an Executive Lounge that houses a conference room for up to 20 people. All executive guests receive complimentary breakfast in the Executive Lounge and complimentary snacks in the evening. There is a butler service available from 6am to midnight. Executive guests also have complimentary access to the health club facilities excluding the floodlit tennis courts. There is free Wi-Fi throughout the hotel and fax facilities available. All Cairo Marriott Hotel guests have access to the following comprehensive services and amenities: 24 hour room service, laundry and dry cleaning services, free in-room safety deposit boxes, unisex hair and beauty salons, a health club with sauna, massage and exercise room, love of the largest heated outdoor swimming pool in Cairo, a ballroom, 3 floodlit tennis courts, a book and gift store, high speed internet, a car rental desk, a travel agency, 2 banks, a florist, boutiques, a pharmacy and an on-call doctor. 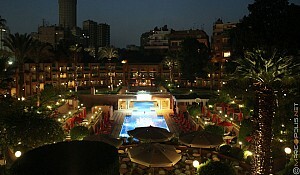 Whether you have come to Cairo for business or pleasure, you will find everything you need at the Cairo Marriott Hotel. For those that love to shop, there are beautiful boutiques and jewellery stores to keep you busy. For those that love sports, the health club, tennis courts and swimming pool mean that you can continue your fitness routine away from home; and for those that come for business, the meeting and banquet services will provide everything one could possibly need for a business trip to run incredibly smoothly. The hotel boasts 35,500 square feet of meeting and banquet facilities. There are 15 multi-purpose conference rooms that can cater for up to 1,000 people and are equipped with state of the art amenities including advanced audio-visual equipment and simultaneous interpretation facilities. The hotel has certified event managers on hand to coordinate any kind of event from start to finish. The 8,000 square feet palatial ballroom is spectacular for extraordinary dinners and receptions that shall not fail to impress. There are also various exquisite salons available to hold truly distinctive events, one of which is the Eugenie Salon, the original dining room of the Palace with capacity for up to 160 guests and which still holds some of the finest antiques from the Palace era. Not to mention the impressive balcony areas overlooking the stunning palatial gardens which are perfect gathering areas for before or after any event. When it comes to dining at the Cairo Marriott, the eclectic selection of food and drink in the Marriott´s restaurants and lounges will delight the most discerning traveller. There are 15 food and beverage outlets within the complex so whether you are looking for sophisticated, relaxed or family dining there is an option to suit. Guests can delight in culinary experiences from around the globe, eating at the Tuscan, Egyptian, or Japanese restaurant to name but a few. Here you will find the only authentic American Steakhouse in Cairo, a wonderful bakery, an English pub, a poolside bar, luxury tea rooms, a live show lounge and a Casino. 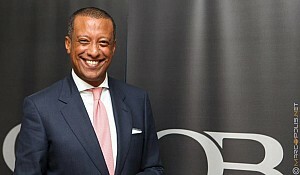 The Omar Khayyam Casino is a world class, sophisticated and luxurious gaming environment. Open 24 hours a day, 7 days a week, it houses all of the most popular games including roulette, blackjack, stud poker and many more. According to General Manager, Richard Zeolla, the Promenade Café in the majestic gardens is the place to be ‘if you want to see or be seen in the city’. 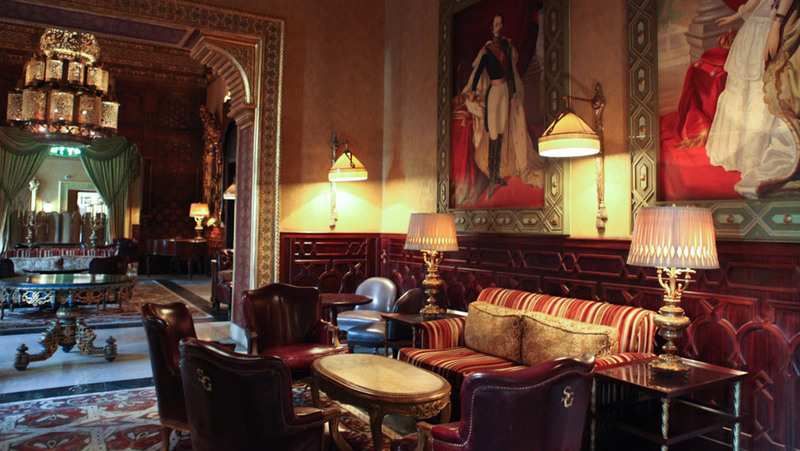 There is even a sophisticated cocktail bar in the original billiards room of the palace, where you can enjoy a delicious drink and think of the royals who before you also enjoyed a drink and a game of billiards in the very same space. Marriott International is changing travel with innovation to help make travel be brilliant. Being a member of Marriott Rewards, when staying at the Marriott you can take advantage of the new Marriott mobile app that lets you check in from wherever you are and check out without having to go to front desk. You can also reserve a work space online just as easily as booking a guest room. And if you are hosting a big event, our Red Coat app allows you to text the hotel staff with your requests and you will receive an immediate response. Furthermore there is the Marriott rewards program, where as a member you will earn much more than just points; you will earn the recognition you deserve at over 3,600 Marriott properties worldwide. The Cairo Marriott Hotel and Omar Khayyam Casino offers a refined combination of yesterday’s opulence and tomorrow’s innovation and convenience. Marriott is more than a hotel; it´s the idea that travel should be uncomplicated, unforgettable and brilliant.